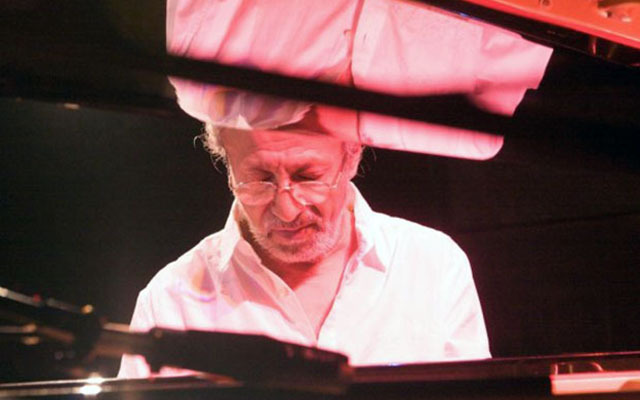 Edy Martínez is a Colombian pianist, percussionist, composer, arranger and musical director who has been living and creating music in New York for over 50 years. You, as a reader or listener, could say that his name does not sound familiar, and you could be right because this artist has not appeared on the majority of the covers of the works he has participated in. Edy Martínez is a humble musician who loves to help other artists create their own magic. Behind the greatest of legends there will always be brilliant people working together around the love for music, and Mr. Martínez is one of those passionate people. His passion for composition and arrangement art goes farther than being the leading protagonist or being noticed on an album cover or in the credit list. His talent has been translated as a pianist, arranger and director on more than 100 albums of jazz, salsa, and Latin jazz. Many of his arrangements have been nominated for Grammy Awards. As a musical director he has accompanied musical icons like Ray Barreto, Gato Barbieri, Tito Puente, Mongo Santamaría and Dizzy Gillespie. As a pianist he has played with almost all the legends and icons of the salsa and Latin jazz world including Rubén Blades, Jerry Gonzalez, Celia Cruz, Alfredito de la Fé, Paquito de Rivera and many others. His story from the beginning has been exciting and full of amazing challenges and magical experiences. Here we go. Eduardo Martínez Bastidas, better known as Edy Martínez, was born in 1942, in San Juan de Pasto, Colombia. He grew up in a family deeply rooted in music, and was exposed to all kinds of music right from the very beginning. His father was a trombonist and musical director, and his mother, a disciplined pianist. When he was just a little baby the family had to leave Pasto and decided to settle in Bogota. His father had won a competition to be a trombonist as part of the National Band. The first instrument Edy had was an accordion; with it his mother gave him the first basic ideas about chords and harmony. He started formally playing an instrument when he was eight years old. In his father´s orchestra little Edy played the conga. By that time Manuel Martínez Pollit, Edy´s father, was already a respectable musician and musical director in the capital. At the age of ten Edy was accepted into the National Conservatory of Colombia where he started studying with a Russian piano teacher. From the beginning he thought that the teacher was too severe and strict for him. One year later young Edy expressed his feelings about the teacher and begged his parents to find another way for him to keep learning music. He promised his parents to do whatever it took to learn music as long as he could have a different teacher. So, Edy’s mother became in charge of his musical learning and his father sat beside him to check his practice of the piano. Four years later, after listening, appreciating and studying the basics of music, he became the pianist and drummer of Américo Belloto’s orchestra. Mr. Belloto, an Argentinian violinist, was the director of the famous orchestra Don Américo y sus Caribes, who played tropical music and boleros. During this time Edy also had the chance to play with Pepe Reyes´ band and with the Cuban singer Alex Tovar. The young Edy was now ready to be part of a record and in 1954 this came to fruition. He played the piano on the album of the Colombian singer Yolima Pérez. He started showing his honest love for music and by the next year was playing the drums with the Chilean pianist Mario Ahumada. The rumors about Edy’s talent were spreading fast and some months later the adolescent appeared as the drummer in a television show with Mexican songwriter Consuelo Velásquez. Before Edy Martínez, other Colombian musicians had already been playing with international Latin stars. Colombian musicians like Hernando Becerra, an experienced artist who, by the 50´s, had already played with Tito Puente and Machito. For musical reasons Mr. Martínez Pollit and Mr. Becerra had already formed a strong friendship. One day, while walking by a downtown street in Bogota, his father bumped into Mr. Becerra. After a warm hug Mr. Becerra invited him to play together at the “Festival de Blancos y Negros” (Black and White Festival) in Pasto. It was during this festival that Mr. Becerra heard young Edy playing the drums. After the concert he, excited, approached the young drummer to ask him about his musical skills. By this time Edy was already reflecting the natural effects of the musical environment that he had grown up in. As a child he had serious exposure to three kinds of music; classical, jazz and Latin music. That pure contact had given him a musical richness that no one in those days could easily obtain. Furthermore his father´s initiative to build a small studio where he could listen, study and play, was the perfect refuge to travel to other worlds and explore new sounds. For Martínez the best teachers were not only in the conservatory, but in that little studio. There were constant meetings with teachers like Tito Puente, Count Basie, Machito and Miles Davis. Martínez started to understand the logic of the two musical worlds which formed in his mind; jazz and Afro Latin music. Bravo Oscar! Great piece on Maestro Edy Martinez. Didn’t Edy Martinez have a daughter called Estellita with a lady called Estella? I remember babysitting that little girl when they lived in the Bronx off The Grand Concourse. Crazy times. I also met Artie Webb at their apartment. My name is Gary Peters, author of the Philosophy of Improvisation (Chicago University Press, 2009) and just finishing another book for Chicago U.P. on improvisation. It contains a strange ‘memoir’ of the San Sebastian Jazz festival 1980 where Edy played with Gato. I was playing too in another band. I wondered if you had a contact email for Edy? I need to ask him a couple of questions relating to that night.